This is not your breakfast cereal. This is like Jesus's breakfast cereal and Superman's breakfast cereal combined, only on steroids and methamphetamines and crack, and with surprisingly low nutritional value. Your breakfast cereal can't even keep you from getting hungry again before noon, though, because all it has are seven healthy grains, and not marshmallows with the power to manipulate time-space. I hate to say it, Kix. You may be kid-tested and mother-approved, but we're talking about the ability to violate Einstein's laws here. 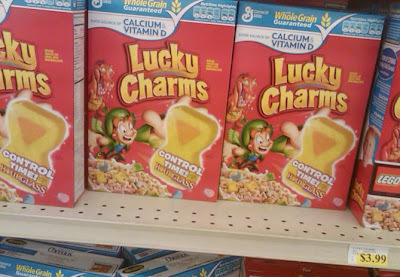 Lucky Charms wins in a landslide. The problem is that it's a gateway physics-defying cereal. I already have one friend who got looped on time-controlling Lucky Charms and gravity-defying Captain Crunch, and is now in suspended animation 300 feet above Fifth Avenue in Manhattan, just hanging there in mid-air with this horrified look on his face. It's pretty gruesome. But it's also a very visible cautionary tale for the children. Gasp! Oh my Zod, I think I just figured out how they're going to end the hit ABC documentary Lost! With a cartoon leprechaun! You're welcome, America, for once again doing your homework for you. This is a very funny message. Maybe the Smoke Monster will get its own cereal at the end?